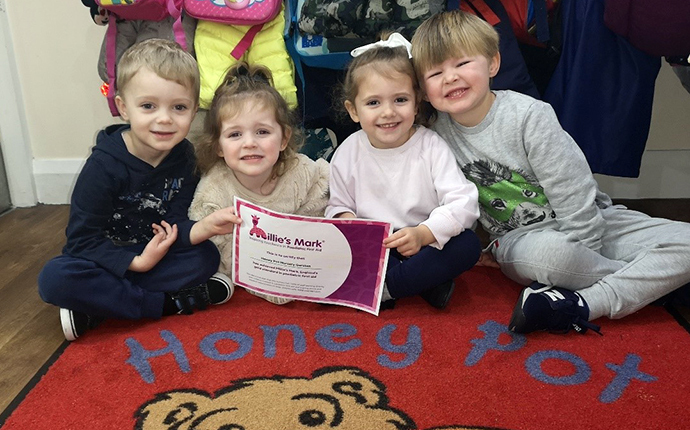 Honey Pot Nursery Garston is the second nursery in the Honey Pot chain. It is a private day nursery which has been operating since 2009. On its last inspection it was judged as Outstanding by Ofsted. The nursery has 130 children on roll and employs 20 staff. We work closely with our sister settings and as a chain decided that achieving Millie’s Mark was something that we wanted to do as a group. We have always regarded our safety practices as exemplary and have always been committed to ensuring our staff have the highest training. The process of Millie’s Mark enabled us to identify where we could tighten up our practices for the benefit of everyone. It also prompted us to act quicker when accessing paediatric first aid training for new staff. The confidence audit revealed where some aspects of first aid needed to be revisited which has benefited the team as a whole and supported their knowledge and practice. We are keen to continue our commitment to Millie’s Mark and improving our practices even further through purchasing training dummies and defibrillators for all of our nurseries. Parents have been highly complimentary about our work and our effort to achieve this mark and as a result are filled with unwavering confidence in the abilities of our staff.